Putting together Easter baskets for our daughters each year is one of our family traditions. Since I steer them away from candy as much as possible, I’ve come up with other inexpensive ideas for filling their baskets. I wouldn’t use all of these items each time, but usually choose from a couple of categories. Books. Surprise, surprise! Knowing how much we love to read, you know I wouldn’t pass up an opportunity to add to our bookcases! I shop ahead to find inexpensive books at a used book store, from our library’s sale shelves, or request them at Paperback Swap. Summer toys. I have used sand buckets as Easter baskets and added shovels, rakes and sand toys. Sidewalk chalk, bubbles, jump ropes or water guns along with sunglasses, inflatable floats, or other pool toys are fun additions. Pajamas, nightgowns or a bathing suit. These are clothing items that I would purchase anyway, so sometimes I make them part of the Easter basket. Accessories. Hair bows, barrettes, jewelry, fancy socks or small purses can be used as part of their Easter outfit for church. An Easter dress for their doll. I try to find a deal on 18-inch doll clothes or accessories by using a coupon at a store like A.C. Moore or Michaels. Art supplies. Coloring books, crayons, markers, pens, paints, markers, sticker pads or clay all provide entertainment for our girls. This year I am including journals which I found in the dollar section at Michaels. Seed packets. This is an idea I haven’t used yet, but I think they would like receiving flower seeds along with with a cute planter for growing their own flowers. Chocolate bunny rabbit. This is my one candy concession, although I may add a pack of gum or mints, too. Bath items. Shower gels, bath poufs and bubble bath are “girly” items that will be used often. Kitchen utensils. This is new for me this year, but I’m planning to get each daughter a small kitchen tool. Measuring spoons, whisks, cookie scoops, and cookie cutters can all be used when they cook with me while also beginning a collection for their own home one day. 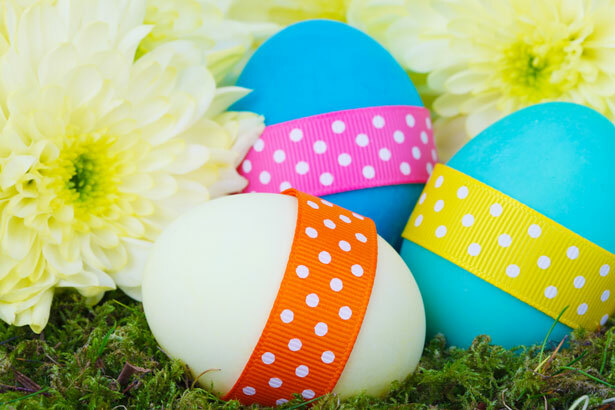 If you do Easter baskets for your children, what are some things you include that they enjoy receiving? This year I'm adding some quick foam craft kits, and spring themed pencils and erasers. I love your idea of books! Brilliant! I usually put a book, a coloring book, bubbles, chalk, and a small toy. This year I have some silly bands that I picked up on clearance and some fun items from the dollar section at Michaels! Great ideas! Thanks for the suggestions! Good list! Easter can be a wonderful time to make memories with your kids without taking away from the meaning of the day. Such great ideas…so much better than all candy!